His guess that ITV might break ranks and go it alone on the TV Debates was laughably wrong. But for some pundits, owning up to being of less than perfect knowledge is unthinkable. 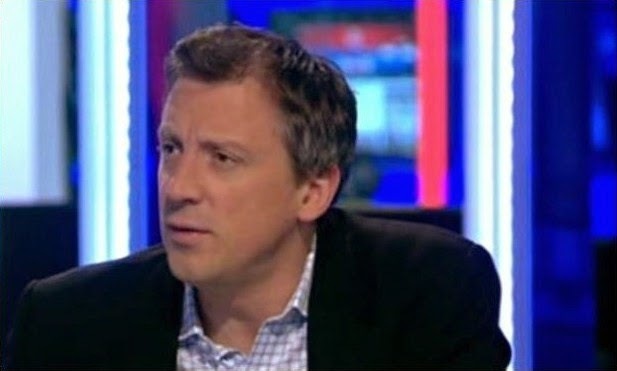 So the Sun’s non-bullying political editor Tom Newton Dunn just dug himself in deeper. And today he was still digging, and getting ever nearer to his Flintstones tribute moment (that is, he’s nearing Bedrock). One might have thought that, having made such a monumental goof, he would do as many non-journalists do, and just stop and think. But that is not the way of the all-conquering Super Soaraway Currant Bun. The Murdoch hackery has to be first to the story, especially if they made it up in the first place. 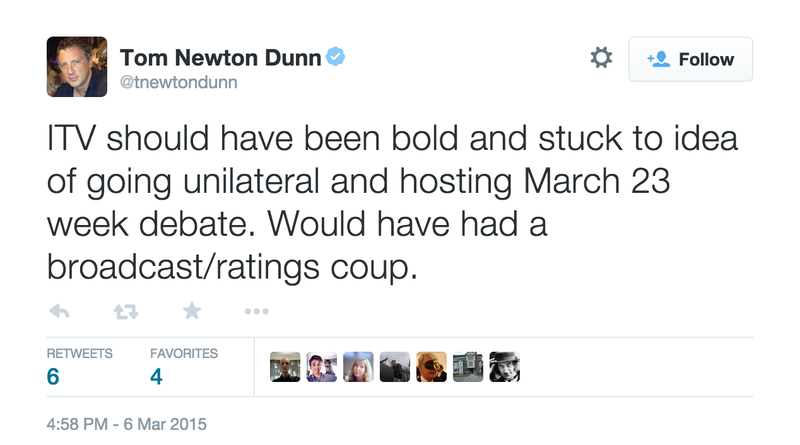 So off has gone Newton Dunn to downplay the TV Debates, and pretend ITV should have supported his guesswork. 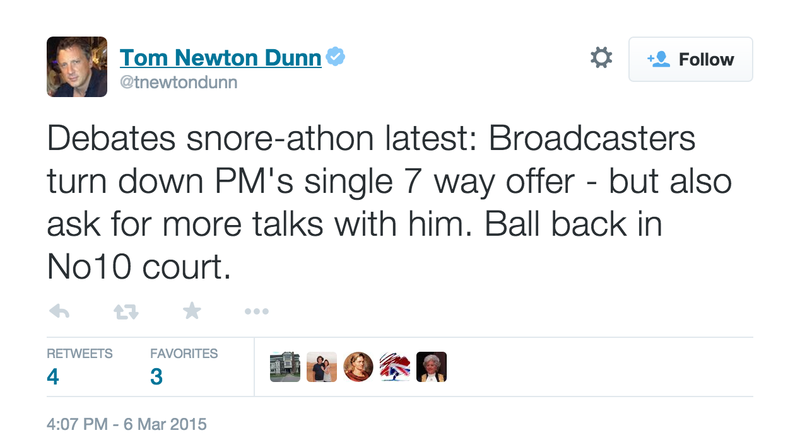 “Debate snore-athon latest: Broadcasters turn down PM’s single 7-way offer - but also ask for more talks with him. Ball back in No 10 court” he reported, which was news to all those who missed the “more talks” angle. But Newton Dunn got his propaganda across - the debates were boring! Not like 2010, when Sky pushed for them, and the Sun thought that Dave would wipe the floor with Pa Broon. And then they were not only boring, but scuppered by No 10 - almost as if Newton Dunn had known the response was coming, so well did it fit with his earlier assessment. 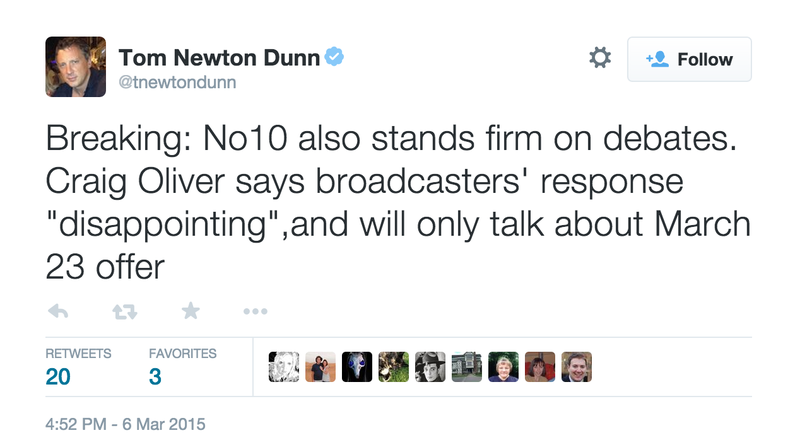 “Breaking: No 10 also stands firm on debates. Craig Oliver says broadcasters’ response ‘disappointing’ and will only talk about March 23 offer”. But don’t worry, by the time the next day’s leader had been written, this had become A Very Good Thing Indeed. But Newton Dunn’s earlier mistake could not be allowed to drop. He was right, and was going to make sure the readers knew it. “ITV should have been bold and stuck to idea of going unilateral and hosting March 23 week debate. Would have made a broadcast/ratings coup”. This argument, though, is circular: it assumes ITV had entertained the idea in the first place, and the only one believing that is Newton Dunn. Such is the desperation to prove that he was right and anyone standing firm against Craig Oliver’s thinly-veiled attempt to have his boss crap out of debates was wrong that Newton Dunn latched onto anything, and I mean anything, to make his point, such as “Wonderful. @krishgm reveals that Sky News’s Jonathan Levy is refusing to debate Jacob Rees-Mogg on #c4news about TV debates”. So what? Levy is not a politician. Good for him. 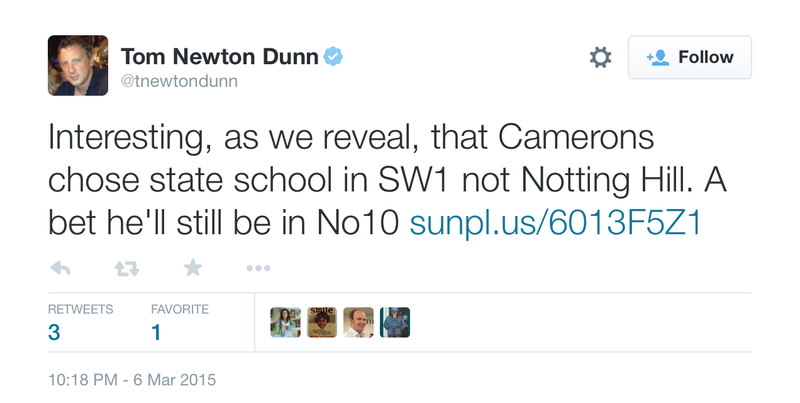 So sure is Newton Dunn of his ground - including the backing for Cameron - that he has continued his mardy-fest today, justifying his earlier howler by telling “Interesting, as we reveal, that Camerons chose state school in SW1 and not Notting Hill. A bet he’ll still be in No 10”. Yeah, right. Cameron was right to crap out of the debates because he’ll still be in power without them, and that means Newton Dunn was right too. Allegedly. Newton Dunn guessed wrong. And he’s not up to spinning it better. End of story.